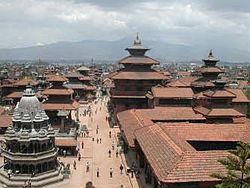 Patan (Sanskrit: पाटन Pātan, Nepal Bhasa: यल Yala), officially Lalitpur Sub-Metropolitan City, is one of the major cities ofNepal. It is one of the sub-metropolitan cities of Nepal located in the south-western part of Kathmandu valley. It is best known for its rich cultural heritage, particularly its tradition of arts and crafts. It is also called as city of festival and feast, fine ancient art, making of metallic and stone carving statue. At the time of the 2001 Nepal census it had a population of 162,991 in 68,922 individual households. Patan is situated on the elevated tract of land in Kathmandu Valley on the south side of the Bagmati River, which separates it from the City of Kathmandu on the northern side. It was developed on relatively thin layers of deposited clay and gravel in the central part of a dried ancient lake known as Nagdaha. 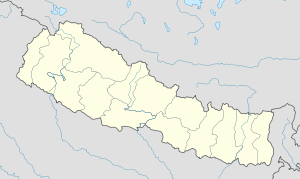 It is among the largest cities in the country, along with Kathmandu, Pokhara, and Biratnagar.